The day shouts summer. A crystalline blue sky stretches languidly from the hill above West 38th Street toward our stunning lake to the north. The Erie Heights neighborhood sits atop this hill, housing gardens galore and residents from all over the world. Three children shoot hoops on the court nearby, and a couple of others fiddle with a bike near their parents' front yard perennials. I'm standing next to a little fenced-in area, planted carefully with tiny trees. The sign at the entrance identifies the space as a Wangari Maathai nursery, with a characteristic photo of that ebulliently smiling, brightly-dressed Kenyan woman holding a tree seedling. Maathai, who died in 2011, left a phenomenal legacy of human rights and environmental activism that rightfully earned her a dizzying list of honors, including the Nobel Peace Prize in 2004. Even more lasting, however, are the more than 51 million trees her organization has planted in community nurseries throughout Kenya. "When we plant trees," said Maathai, "we plant the seeds of peace and hope." The trees in this Erie Heights nursery don't look like much right now. They're just seedlings. Pint-sized and unremarkable. And, at this point, they reveal little of what they'll eventually become. It takes a lot of trust, hope, and vision to believe they hold — in their diminutive selves — the intrinsic power to provide shade, shelter, clean air, and comfort to those lucky enough to live near them one day. But these seedlings mirror so many of the children in this neighborhood — or in any neighborhood, the world over. It's impossible to fully conceptualize what they might potentially grow into. It takes a true visionary to nevertheless provide them with enough light, nurturing, loyalty, and loving care to make them reach for the sky. Wangari Maathai was that sort of visionary. And now, John Horan, Executive Director and Secretary of the Housing Authority of the City of Erie (HACE), is cultivating Maathai's vision in our own community. In 1977, Maathai founded the Green Belt Movement (GBM) in Kenya, responding to "Rural Kenyan women who reported that their streams were drying up, their food supply was less secure, and they had to walk further and further to get firewood for fuel and fencing," according to the GBM website. "GBM encouraged the women to work together to grow seedlings and plant trees to bind the soil, store rainwater, provide food and firewood, and receive a small monetary token for their work." Today, the GBM's mission is to "strive for better environmental management, community empowerment, and livelihood improvement using tree-planting as an entry point." In her 2006 autobiography, Unbowed, Maathai writes, "When people learn about my life and the work of the Green Belt Movement and ask me 'Why trees?,' the truth of the matter is that the question has many answers. The essential one was that I reacted to a set of problems by focusing on what could be done." A lifelong doer, Maathai was an academic of the best possible sort. She combined the intellect to imagine solutions to complex problems with the audacity to employ creative, direct action to actually solve them. And her academic journey began in the American midwest, just as John Horan was embarking on his own. "It's quite a story," Horan explains. Maathai graduated in 1964 from Mount St. Scholastica College in Atchison, Kan., the same year Horan graduated from St. Benedict College, its sister Benedictine school. "We were college classmates. But one college was for men, one for women, and they were on either side of Atchison. They had to have a city between us!" Maathai's attending Mount St. Scholastica was sponsored by a program called American Airlift, which brought nearly 800 promising students from Kenya to the U.S. to attend universities. She earned her master's degree at the University of Pittburgh, then obtained her Ph.D. from the University of Nairobi, the first woman in East and Central Africa to earn a doctorate. "She was an environmentalist, democracy activist, and women's rights advocate at a time when Kenya had just gotten independence from Britain," Horan notes. Maathai defied the oppressive status quo at every turn, withstood being beaten and jailed repeatedly, and received death threats that forced her into hiding during part of the early 1990s. Her unbridled courage and commitment to nonviolent protest became lasting examples for millions globally, proving that positive change is seeded within the power of one. Horan didn't know Maathai during college. But he went back to Atchison last summer for their 50th reunion, where the now-coed Benedictine College dedicated a monument to her and elaborated on the incredible legacy she'd left. When he learned about how Maathai's nurseries worked, a decade-old dream was reawakened. "Ten years ago," he recalls, "we'd started a project here to plant 1,000 trees." Back then, however, HACE was planning to plant fairly mature — and therefore quite expensive — trees, and the cost became prohibitive. "Unfortunately, we had to put money toward other priorities," he says. "But last summer, I found out about Wangari's nurseries. It gave me the motivation because she showed me how to do it. She mobilized a lot of people across her country — 600,000 volunteers in 6,000 nurseries — and was responsible for the planting of 40 million trees." Here in Erie, HACE organized four plantings this spring. Incredibly, Horan says, they managed to pick four rain-free days, over which they planted 1,032 trees at 14 sites. Appropriately, the first planting of 250 18-inch seedlings took place on Arbor Day, April 24, at the John E. Horan Garden Apartments. Another commenced at Erie Heights on April 29, and two more plantings followed in May. 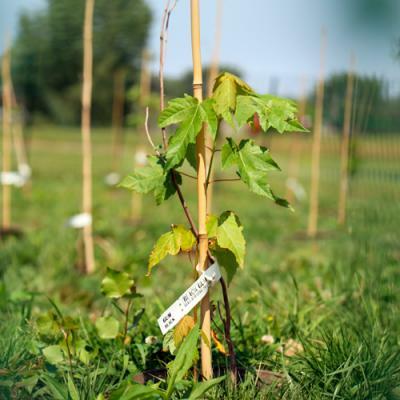 The seedlings, including Washington Hawthorne, Black Locust, Red Maple, Red Mulberry, Red Oak, English Oak, and Serviceberry, are planted in 50- to 100-tree nurseries, and will be replanted throughout HACE neighborhoods once they mature. Maathai's manageable method is such an ingenious idea that HACE has easily found collaborators. For one, news of Maathai's approach and Horan's goal of implementing reached the Benedictine Sisters of Erie. The sisters take up special collections twice a year, and decided to donate this year's entire $3,000 Easter collection to the HACE tree-planting program. "We didn't even ask them for it," Horan marvels. The bulk of money came from the HACE operating budget, Horan adds, with recycled mulch coming from the city. "Potratz gave us good deal on seedlings, and all labor was volunteer," he figures, "so we only have about $7,000 to $8,000 in the project so far, and that's including our $3,000 donation." The program also involves efforts by the YMCA Kids Club, the John F. Kennedy Center, the Quality of Life Learning Center, and the Girl Scouts, to meet both environmental and educational goals. As it progresses, HACE hopes to expand educational opportunities for children to learn about Maathai, the role trees play in life, and how to care for and appreciate trees. "Coincidentally," adds Horan, "the two public libraries in public housing had just acquired a book about Wangari, titled Wangari Maathai: The Woman Who Planted Millions of Trees. It's the perfect book for kids to learn about her. So that became our curriculum. We're just getting started, but we'd like to continue this program with new kids every year." Maathai argued that "You cannot protect the environment unless you empower people, you inform them, and you help them understand that these resources are their own, that they must protect them." The Housing Authority's motto — it's about people — gels perfectly with Maathai's mission. "Her story is so inspiring, and it resonates with our people big time. It shows the power of one person, or one organization. We've mobilized people who live in public housing — especially children — to plant these trees. Here we are now — it's been about four months — and not one of these trees have been touched. It's incredible the amount of ownership these kids and families have taken." These seedlings mirror so many of the children in this neighborhood — or in any neighborhood, the world over. It's impossible to fully conceptualize what they might potentially grow into. As the trees grow, HACE will welcome volunteers interested in helping with fall or spring cleanup efforts. "We're more interested in people's time and effort than their money," says Horan. "We especially need to help these trees through the winter." And as Maathai exemplified, when we help trees, we help each other. In her 2004 Nobel Lecture, Wangari Maathai stated, "In the course of history, there comes a time when humanity is called to shift to a new level of consciousness, to reach a higher moral ground. A time when we have to shed our fear and give hope to each other. That time is now." For more information or to volunteer, please contact John Horan at the Housing Authority of the City of Erie at 814.452.2425.